The court denied defendants' motion for summary judgment on the ground that plaintiff’s oxygen system patent encompassed unpatentable subject matter because defendants relied on a provisional application to establish that the asserted claims were directed toward an abstract idea. "Much of Defendants’ Motion for Partial Summary Judgment is based upon the incorrect premise that this Court should only look to the provisional patent application to determine abstractness. As a fatal flaw, Defendants point to no legal basis for such a premise, and this Court has not independently identified any such basis. . . . [I]t would seem that Defendants concede that the patent was in fact not issued for an abstract idea but rather for 'a very specific system.'" Following the Supreme Court decision in TC Heartland LLC v. Kraft Foods Group Brands LLC, No. 16-341 (May 22, 2017), the court granted defendants' motion to modify their pending motion to dismiss under Rule 12(b)(6) to add a ground of improper venue and found there was no waiver by failing to raise the issue in their original motion. "[Plaintiff] contends an argument for an improper venue was available to Defendants, and has been since 1957 when the Supreme Court announced [Fourco Glass Co. v. Transmirra Products Corp., 353 U.S. 222 (1957)]. A defendant waives the defense of improper venue if it was available but the defendant omitted it from its responsive pleading or from a motion made before its responsive pleading. . . . TC Heartland abrogated approximately 27 years of patent law precedent. . . . For the first time in 27 years, a defendant may argue credibly that venue is improper in a judicial district where it is subject to a court’s personal jurisdiction but where it is not incorporated and has no regular and established place of business. Defendants could not have reasonably anticipated this sea change, and so did not waive the defense of improper venue by omitting it from their initial pleading and motions." New Trademark, Copyright and Antitrust Docket Reports Now Available (Free Through 2017)! Docket Navigator is pleased to announce the release of new Docket Reports covering federal Trademark, Copyright and Antitrust litigation. 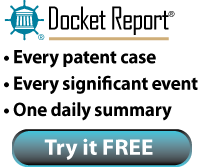 Like the Patent Docket Report, the new Docket Reports will include professionally written summaries of all new cases and significant decisions with free links to the underlying pleadings, court orders, and docket sheets. You can also create alerts for individual cases to track new filings and perform searches on a limited scope of data in our new search engine, Compass, which is in beta. The new Docket Reports are free through the end of 2017. This extended preview period allows plenty of time to evaluate before deciding whether to budget for a subscription. It also allows us time to receive feedback and make changes, if necessary, before we begin charging for the service in 2018. Of course, there is no obligation to subscribe after the free preview, and there will be no "surprise" auto-billing of any kind. To receive any of the new Docket Reports, please click here. Following the Supreme Court decision in TC Heartland LLC v. Kraft Foods Group Brands LLC, 137 S.Ct. 1514 (2017), the court granted defendants' motion to dismiss plaintiff's patent infringement action for improper venue because plaintiff failed to present sufficient evidence that defendants had a regular and established place of business in the forum. "'The fact that [defendants] are authorized to do business in Texas is not controlling and will not establish the [§ 1400(b)] requirement.' Nor does defendants' website allowing viewers to access a list of San Antonio/Austin distributors provide venue under the patent infringement statute. Finally, the fact that defendants sell their activity trackers to distributors in Texas Western will not establish venue. . . . Therefore, the kind and degree of defendants’ contacts do not support a finding that defendants have a permanent and continuous presence which shows a regular and established place of business in the Western District of Texas." The court denied defendant's motion to dismiss plaintiff's patent infringement action for lack of standing because plaintiff obtained substantial rights to the patents-in-suit through its assignment from the prior owner even though it had to surrender 100% of litigation and licensing proceeds to the prior owner. "[Plaintiff's] Agreement is nearly identical to the [prior owner's] Agreement. The only difference is that the transferee must pay 100% of the gross proceeds from litigation and licensing to the transferor, rather than 50% in the [prior owner's] Agreement. Again, this is compensation for the transfer that does not reserve any control for the assignor over the Asserted Patents or their use. . . . Defendant argues that Plaintiff has no economic interest because he must surrender the gross proceeds from the litigation to [the prior owner]. However, this does not diminish Plaintiff’s rights to the Asserted Patents for the purpose of standing. Any infringement of Plaintiff’s exclusive right to make and sell the patented products would still cause Plaintiff to suffer a justiciable injury, regardless of whether he retains any damages awarded for that injury." The court sanctioned plaintiffs for producing an unsolicited addendum to their damages expert report which required defendants to file a motion to strike. "The Court has now three times granted Defendants’ Daubert Motions on the issue of [the expert's] estimation of indirect sales in the United States to prove damages for indirect infringement. . . . Given that the Court’s orders have been entirely clear and [plaintiff] has provided no justifiable explanation for why [the expert] impermissibly supplemented his report without leave of Court on the eve of trial, thereby forcing [defendants] to file the instant emergency motion, the Court finds that fees for the motion are appropriately awarded to [defendants]." The court denied defendants' motion to transfer venue based on the recent Supreme Court decision in TC Heartland LLC v. Kraft Foods Group Brands LLC, 137 S. Ct. 1514 (2017), because defendants waived their objection to venue. "[N]either [defendant] affirmatively sought dismissal or transfer because of the lack of 'resid[ence]' or the lack of a 'regular and established place of business' under § 1400(b) as interpreted by [Fourco Glass Co. v. Transmirra Prod. Corp., 353 U.S. 222], until . . . less than two months from trial. . . .The Court need not reach Defendants’ argument that a change in law constitutes an exception to waiver under Rule 12(h)(1)(A) because the Supreme Court’s decision in TC Heartland does not qualify. . . . 'TC Heartland does not qualify for the intervening law exception to waiver because it merely affirms the viability of Fourco.' [One defendant] argues that Defendants 'each expressly reserved their rights to challenge venue in the event TC Heartland changed the law,' but a defendant cannot state that it does not dispute venue while reserving the ability to later contest it. To conclude otherwise would undermine the purpose of Rule 12(g) and (h) to promote efficiency and finality." The court granted plaintiff's motion to strike defendants' infringement contentions based on representative accused products as insufficient. "[T]he patent owners have not adequately shown that their purportedly representative claims in fact share the same critical characteristics as other accused products. . . . [T]he patent owners will be strictly limited to accusing products that truly fit the theories described in their infringement contentions. The patent owners do not have leave to amend to add explanations about how the charted accused products are representative of other accused products. Nor do they have leave to amend to chart additional 'representative' products." The court denied defendant's motion to compel the production of documents and rejected defendant's argument that plaintiff's non-practicing entity status precluded it from asserting privilege over ongoing business valuations of the patents-in-suit. "[Defendant] asserts that [plaintiff] cannot assert privilege over these documents due to the nature of its business: [plaintiff] only acquires and then licenses or litigates patents, so the information relates only to a business purpose. But the nature of [plaintiff's] business should neither preclude it, as a general matter, from asserting attorney-client privilege nor automatically shield all of its patent-related documents." The court denied plaintiff's motion to strike portions of defendants' invalidity contentions concerning their assertion that a set of working group papers qualified as a single prior art reference, but ordered defendants to provide more specific invalidity contentions. "Plaintiff contends that this reference contains twenty-three documents that are not a 'prior art instrumentality.' . . . Defendants argue that the close relationship of the documents is demonstrated in that they are all seeking to solve the same technical problem, they are submitted using the same common format and numbering for the 3GPP working group, they were submitted by members of the group for a common purpose, and they were developed within a relatively small time frame. . . . [A]s a general matter, a network, or network solution/procedure, can constitute a single prior art reference and may include associated references that describe that network and/or solution. The fact that a network could constitute a single prior art instrumentality particularly makes sense where the allegations of infringement read onto specific network procedures as they do here. . . . While the Court finds that Defendants will be allowed to use these documents as a single reference, the Court finds that Defendants shall supplement their contentions to specifically identify the who, what, why, when, and where of the solution they seek to sufficiently put Plaintiff on notice." The court granted in part defendants' motion for summary judgment and found that plaintiff's claims for one of its boot design patents was barred by equitable estoppel because defendants suffered economic prejudice from plaintiff's misleading conduct. "In their [response] to [plaintiff's cease and desist letter], Defendants offered to completely cease selling the [accused] boot and to pay $1,500 to [plaintiff], which was based on profits from selling 240 [accused] boots. Had [plaintiff] accepted the offer, this would have been the extent of Defendants’ loss (or at least something close to it). Now, six years later, Defendants have sold over 750,000 knit boots, a substantial portion of which form the basis of [plaintiff's] damages claim. . . . [H]ad [plaintiff] accepted Defendants’ offer to cease selling the product [8 years ago], the time and money Defendants subsequently invested in the [accused] boot could have been spent on other products or business ventures." The court denied defendant's motion to dismiss on the ground that plaintiff’s email monitoring and tracking patents encompassed unpatentable subject matter because the asserted claims were not directed toward an abstract idea. "[Defendant's] abstract idea challenge is without merit as there is no credible argument that a patent on a system and methods for 'monitoring website activity' claims a longstanding commercial practice. The functionalities claimed in the patents were not imaginable before the Internet. Even after email came into use, the functionality claimed in the patents did not exist until plaintiff’s invention solved the technical problems associated with how email normally worked. . . . [T]he patents-in-suit overcame the problem of finding out whether a user opened an email or clicked on a link within the email. Those are problems confined to the Internet, and the patents provide Internet-based solutions." Following the Supreme Court ruling in TC Heartland, the court granted defendants' motions to transfer plaintiff's patent infringement action from the Southern District of Ohio to the Southern District of Texas because plaintiff failed to establish that defendants committed the acts of infringement in the forum or had a regular and established place of business there. "The unsupported allegations of plaintiff's complaint that defendants sold and/or offered for sale accused product to a company in this judicial district are insufficient to establish that defendants committed acts of infringement in this district for purposes of venue under § 1400(b). . . . [P]laintiff has not provided any evidence to establish that defendants employ local representatives or store any product in this district. The fact that defendants may communicate by email or telephone with customers in the Southern District of Ohio or ship product from Texas to customers in this district does not establish that defendants have a permanent and continuous presence here. . . . Likewise, the allegation that defendants 'may have physically visited .. . or otherwise been in this district for business' is not sufficient because even if true, such visits do not establish a permanent and continuous presence." The court overruled defendants' objection to the magistrate judge's recommendation to deny defendants' motion for summary judgment that plaintiffs were not entitled to lost profits damages because no infringing alternatives existed in the but-for world. "Defendants insist that the but-for world to which comparisons must be made in order to assess [plaintiffs'] claim for lost profits damages is a world in which non-party manufacturers of generic carvedilol would have existed, and from which direct infringers (i.e., physicians) would have obtained carvedilol. . . . The undisputed evidence is that Defendants' generic carvedilol is interchangeable with the generic carvedilol of the non-party manufacturers; therefore, the generic carvedilol of these non-party manufacturers is an infringing alternative - and not a noninfringing alternative. These non-parties' products, thus, would not exist in the but-for world, which must be constructed to include 'likely outcomes with infringement factored out of the economic picture.'. . . That there is no evidence that the non-party generic manufacturers could be held liable for induced infringement, while Defendants are charged only with induced infringement, does not alter this conclusion. The issue for the lost profits calculation is whether the product is non-infringing, not whether the alternative supplier has been, or could be, successfully sued for infringement." ​ The court denied plaintiff's motion to exclude as unreliable the testimony of one of defendant's damages experts regarding his opinion that $6.16 billion was a reasonable royalty as to six patents-in-suit on the ground he failed to apportion between patented and unpatented technologies. "[Defendant] argues that the Federal Circuit has approved the methodology of calculating a reasonable royalty rate based on comparable licensing negotiations without performing a separate apportionment analysis on the smallest saleable unit. In comparing the licenses here, [the expert] showed that . . . the licensed patents had 'extraordinarily similar technology' to the technology of the patents being asserted here. [The expert] also identified indicia of economic comparability between the comparable license agreements and the hypothetical licenses involved here, as well as any effect of alleged differences between them. . . . [His] method is consistent with the Federal Circuit's approved methodology for valuing asserted patents based on comparable licenses. . . . Whether the prior license agreements [he] relied on are sufficiently comparable to support his proposed reasonable royalty is a factual issue best addressed by examination, including cross-examination, at trial." The court denied defendants' motion to transfer venue due to waiver and rejected defendant's argument that the Supreme Court's recent ruling in TC Heartland qualified as an intervening change in law excusing such waiver. "Based on the Supreme Court's holding in [TC Heartland LLC v. Kraft Foods Grp. Brands LLC, No. 16-341 (U.S. May 22, 2017)], Fourco has continued to be binding law since it was decided in 1957, and thus, it has been available to every defendant since 1957. Accordingly, the Court finds that TC Heartland does not qualify for the intervening law exception to waiver because it merely affirms the viability of [Fourco Glass Co. v. Transmirra Products Corp., 353 U.S. 222 (1957)]. [Defendant's] assumption that Fourco was no longer good law was reasonable but wrong, and it cannot be excused from its waiver by saying there was a change in the law. . . . ' Because the Supreme Court did not change the law, retroactivity is also not at issue, and the Court does not address Defendant's arguments regarding retroactivity." Following a jury verdict of $234 million, the court granted in part plaintiff's motion for an ongoing royalty and awarded a royalty at the same rate proposed by plaintiff's damages expert at trial. "[Plaintiff] seeks an ongoing royalty of three times the implied jury’s per unit rate but provided little justification for this figure. . . . [Defendant's] proposal that the court simply award the rate awarded by the jury for the past infringing sales is a non-starter. . . . Relying on [its] expert . . . [plaintiff] sought a royalty rate of $2.74 per unit, which the jury discounted, presumably because the jury found [plaintiff's] bargaining position during the hypothetical negotiation was not as strong as it maintained. In light of [plaintiff's] improved bargaining position after the jury’s finding of infringement and validity, the court finds that the $2.74 rate is fair and reasonable." Following remand, the court awarded defendants over $700,000 in attorney fees under 35 U.S.C. § 285 and rejected plaintiff's argument that fees should be limited to those incurred because of its litigation misconduct. "Plaintiff’s suggestion that any fees awarded in this case must 'only compensate for the extra legal expense caused by the litigation misconduct' is unpersuasive. . . . This Court found that the case was exceptional because Plaintiff’s efforts to manufacture venue, the use of a privileged email, and because of the overall weakness of the merits of Plaintiff’s positions taken at the [PTO]. It was not only Plaintiff’s conduct throughout the litigation, but also the objective weakness of Plaintiff’s proposed constructions before the [PTAB]. . . . Plaintiff’s misconduct permeated throughout the entirety of this matter. From the start of this litigation until the motion for attorney’s fees, Plaintiff’s conduct has stood out from the usual case. Accordingly, Defendants are entitled to their full fee as calculated by the lodestar method." The court granted plaintiff's motion in limine to preclude defendants from asserting invalidity grounds based on competitors' product manuals because the manuals were reasonably available through searching and therefore could have been raised as grounds for unpatentability in defendant's earlier petition for inter partes review. "Defendants assert that manuals for prior art products are not estopped because they were not reasonably available through searching. Plaintiff counters that Defendants' executives knew about the competitor that had the products at issue, and Plaintiff argues that Defendants' position is disingenuous. This issue is a credibility issue because the manuals are undoubtedly printed publications, and Defendants' awareness of the manuals is the only question affecting whether these references are estopped. The Court does not believe that Defendants were unaware of a larger competitor's product lines, and thus, the Court finds that the [product] manuals were reasonably available through searching." The court ordered additional briefing on defendant's motions to dismiss or transfer plaintiff's patent infringement complaint in light of the Supreme Court's recent ruling in TC Heartland and plaintiff's allegations against a resident John Doe defendant. "Plaintiff and [defendant] shall rebrief the issue of transferring this action in the wake of the intervening changes in governing law and Plaintiff's subsequent allegations against Defendant John Doe in the Amended Complaint [including] [w]hether a transfer of this action under 28 U.S.C. § 1404(a) is warranted after the United States Supreme Court's holding in TC Heartland, LLC v. Kraft Foods Group Brands, LLC, No. 16-341 (U.S. May 22, 2017), and after the addition of the John Doe Defendant [;][and] [w]hether Plaintiff had a good faith basis for pleading John Doe's residence in Paragraph 9 of the Amended Complaint." Following a jury verdict of willful infringement, the court granted plaintiff's motion for attorney fees under 35 U.S.C. § 285 because defendant's litigation tactics were exceptional. "There can be no doubt from even a cursory review of the record that [defendant] pursued litigation about as aggressively as the court has seen in its judicial experience. . . . [Defendant] maintained its reliance on nineteen invalidity theories to the eve of trial, and then at trial presented only a single defense of anticipation and a single claim of invalidity under § 112. . . . [Defendant] asserted many more defenses through the summary judgment exercise, causing [plaintiff] to expend its resources on responding to such motions, all of which were denied. . . . [T]he court understands the need for flexibility in terms of allowing attorneys to vigorously pursue the best interests of their clients; as a consequence, the court has rarely awarded fees pursuant to § 285. However, [defendant's] litigation strategies in the case at bar created a substantial amount of work for both [plaintiff] and the court, much of which work was needlessly repetitive or irrelevant or frivolous. Of course, the fact that the jury found that [defendant's] infringement was willful is yet another factor to be considered." Following a jury verdict of willful infringement, the court granted plaintiff's motion for enhanced damages and doubled the jury award of $23.6 million. "[S]ome enhancement is appropriate given [defendant's] litigation conduct, its status as the world's largest networking company, its apparent disdain for [plaintiff] and its business model, and the fact that [defendant] lost on all issues during summary judgment and trial, despite its formidable efforts to the contrary. Even assuming for purposes of the record that [defendant] has undertaken some post-trial remedial actions, the court concludes that a doubling of the damages award is appropriate." The court granted plaintiff's motion in limine to preclude invalidity arguments based on certain patents and printed publications due to IPR estoppel, but denied the motion as to prior art systems. "While [defendant] will be permitted to present its defense of invalidity based on [two prior art] systems, [defendant] will be limited to using any documents that qualify as patents or printed publications solely for the purpose of establishing the date on which the [two prior art] systems were in public use or on sale. [The motion is] denied as to [plaintiff's] argument that [defendant] is estopped from asserting the [two prior art] systems as prior art." The court denied defendant's motion for summary judgment that a patent-in-suit was not entitled to the filing date of the provisional application on the ground that the application did not disclose certain limitations as determined by the PTAB. "[Defendant] contends that the Court should apply substantial deference to the findings of the [PTAB], which at one point concluded that the provisional application did not disclose the offset band limitations and therefore the priority date of the [patent-in-suit] was its filing date. . . . [N]either party is appealing or directly challenging through some other statutory mechanism a decision by the PTAB. Therefore the cases cited by [defendant] do not require the Court to defer to the PTAB's findings. Further, the PTAB made this finding regarding the [patent] priority date in an order setting out its decision on a request by [defendant] to institute inter partes review. . . . The Federal Circuit has indicated that even the PTAB itself is not bound by findings it makes in decisions to institute inter partes review. . . . [Plaintiff] has now provided the Court with an expert declaration that impacts the determination of the priority date. The Court therefore declines to defer to the PTAB's preliminary determination on this issue."